Great food for a great cause! 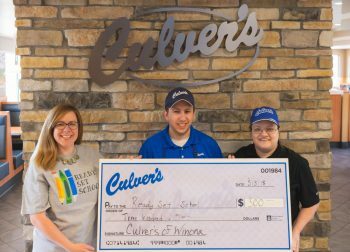 Culver’s of Winona partnered with Ready Set School on May 1st for “Ready Set Culver’s”, an event that raised over $300 to help local k-12 students prepare for the upcoming school year. Pictured (L-R): RSS Board Member Heather Casper, Culver’s General Manager Tim Vodak, and Culver’s owner Ellen Minter.